Yoshiharu Osaka Shihan is 8th Dan JKA and Deputy Managing Director of JKA. He is the ‘living textbook' of Shotokan and has been the 'blue-eyed boy' of Masatoshi Nakayama Sensei, 9th Dan JKA Chief Instructor (1913-1987). Osaka Shihan featured in numerous JKA Videos and magazines around the world and has won the All Japan JKA Kata title record 7 times, each year in succession. He is world renowned for his expertise in kata and is the epitome of JKA Shotokan. A technical expert par excellence, he is a quiet humble man, with a smiling disposition. He exhibits internal strength in his techniques, which 'are penetrating' and “his kata is of the first rank” as described by the Late Nakayama Sensei. 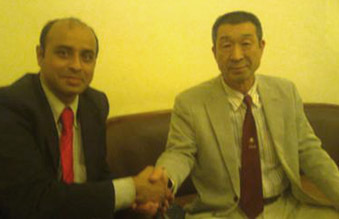 Osaka Shihan was in India for the JKA India National Camp & Championships at Kolkata, India, from Jan 22-28th, 2012. Myself (being a Shotokan karate student) I have trained in JKA Karate from the 1980’s hence I took up this golden opportunity to interact with the legendary Master of Karate-do and present Karate enthusiasts, a brief tete-a-tete from Osaka Shihan. Many thanks to Anil Sinha Sensei, 6th Dan and JKA India Chairman, Anand Ratna Sensei, 6th Dan and JKA India Chief Instructor / Executive Head and Sensei Neeraj Dhawan, 5th Dan JKA for facilitating and interpreting the interaction with Osaka Shihan. Arijit: Oss Shihan, Please share how JKA is looking at karate training and research aspects. Osaka Shihan: (on JKA Karate- technical evolution and research) Oss, you see JKA karate has always been hard, fast and tough, strong Kime (shihan shows a strong punch, which we barely can see it’s so fast! ), in recent years we are doing more research on how to harmonise kihon, kata and kumite for all-round physical and mental development. Younger JKA Instructors like Naka, Kurihara, Kobayashi and others are continuously seeking new ways of approaching technique; adopting a softer approach, utilising ki energy and ensuring karate training can bring lifetime benefits. Osaka Shihan: (on JKA karate as a method of stress management) Very good question. Lets remember that Karate is also for health, for life. Many students come to the JKA Honbu dojo for learning, once or 3 times a week, some can afford daily practice, depending on their profession, flexibility etc. I say- you please decide on your training first, fix it, and then follow it. You may lie on just half the tatami, but when you practice, use the full tatami, so utilise all your time and space fruitfully this will bring holistic development in character and technical capacity. Arijit: Shihan, your thoughts please on sports Karate? Osaka Shihan: (smiles) sports karate is so popular but the career span is only 10 to 15 years, you retire by 35 maybe? but traditional karate is life long, you also practice and benefit in your 70’s, understand body limitations, appreciate the mental aspects, how mind and spirit are together. Lifetime dedication is so important. See Sensei Ueki, Tanaka, Sugiura, at advanced age they are so fast and strong. This is consistency and sincerity in training. Karate helps to expand your lifespan. Please understand that development never ends, so one should choose between short term gain, like in sports karate, and lifelong benefit, like in traditional karate, with strong focus on kihon and kata. Arijit: Shihan, we are just inspired by your unparalleled record in kata. May I call you Kata King? What is your secret, shihan, please share? Osaka Shihan: (laughing) No no, please see I have no secret! I do daily training, 'moving zen' is kata, do it with sincerity, from the heart, go till saturation, then push harder and go beyond. I always say “Mukin Shori” the way to success has no short-cut! Arijit: Shihan, please share your favourite kumite technique and kata? Osaka Shihan: (smiling) always gyaku-zuki! (shihan demonstrates as we move away, really powerful! ), as for kata, I have always loved Sochin, I just try to practice it more. Arijit: Shihan, please share your message for Shotokan Karate ka and all martial artists? Osaka Shihan: Please train and use each other, learn together, learn and respect each other, understand body structure and related techniques, try, learn, practice, be open, flexible, experiment, ask, seek and pass on. Diligent focussed study is vital. Development is like a never-ending staircase - you go up and up - try harder! Arijit: Oss Shihan, thanks so much for your time and thoughts. Thanks also to Anil Sinha Sensei, Anand Ratna Sensei and Neraj Dhawan Sensei. Osaka Shihan: (smiling) Oss, Arijit San. This man is truly an inspiration for me. He is the reason why I push myself hard to practice karate. sensei Yoshiharu Osaka has clear Ki. Short & Sweet. Anything on Osaka sensei seems great.